Southwest Yachting celebrates its 29th anniversary in 2019 and are proud to be one of the most established Yacht Charter Companies and RYA training centres operating in the Solent. Based out of Lymington we offer RYA practical courses of Start Yachting, Competent Crew, Day Skipper and Coastal Skipper, we also offer a range of RYA shore based theory courses including Day Skipper, Coastal/Yachtmaster, VHF Radio Operator, First aid and Sea Survival. This coming season why not try a holiday afloat on one of our Skippered Sailing Holidays (families welcome) on board White Oryx IV. These holidays will be great fun, visiting the wonderful islands of Alderney, Guernsey and Jersey, the harbours of Cherbourg and St.Vaast, or the beautiful ports of Dartmouth, Salcombe, Fowey and Falmouth. For our corporate clients our Hospitality and Team Building packages continue to be very popular. This year we have launched Corporate Partners giving you a great opportunity to promote your company, reward employees or entertain clients on board our beautiful Bavaria 38 ‘White Oryx IV’. The Corporate Partners package offers great value. 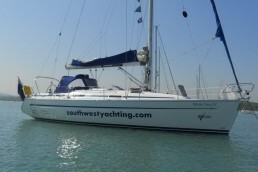 Our fleet of luxury sailing yachts is one of the finest in the Solent. Combined this with our fabulous onboard catering, and professional friendly skippers, Southwest Yachting guarantees you a fantastic day on the water. Don’t delay if you are interested in Round the Island Race, Cowes Week or the Little Britain Challenge Cup, yachts are going quickly! Whether you are a complete sailing novice looking to give sailing a try for the first time or a would be Yachtmaster looking for your final prep course before your examination, we are here to help. What’s more, with our terrific Winter Special Offers it has never been more affordable to get on the water. For an informal discussion and bespoke quotation contact us today on +44 (0) 7831 644394.